European Trade Commissioner Cecilia Malmstrom talks to journalists during a news conference at the European Commission headquarters in Brussels, Monday, April 15, 2019. FILE - In this Monday, Oct. 15, 2018 file photo, a container ship is loaded at the harbor in Hamburg, Germany. 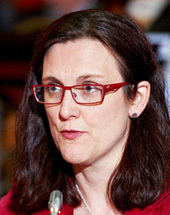 BRUSSELS (Reuters) - The European Union is ready to start talks on a trade agreement with the United States and aims to conclude a deal before year-end, European Trade Commissioner Cecilia Malmstrom said on Monday. The EU approved two areas for negotiation, opposed by France with an abstention from Belgium.